Cook noodles according to package. Drain. Meanwhile heat 1 tablespoon of vegetable oil in a large saucepan over high heat. Add curry paste and stir fry for 30 seconds. Quickly add coconut milk and 2 cups boiling water (I brought water to a boil in my teapot). 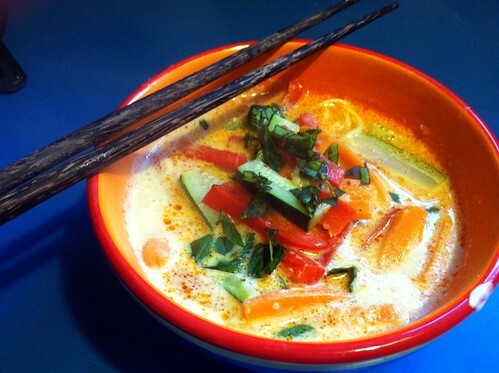 Bring coconut curry broth to a boil and add vegetables. Simmer for 2 minutes or until vegetables are cooked to your liking. To serve, put some noodles into a bowls. Pour over soup and vegetables and top with basil leaves.